Made for normal to dry skins, WELEDA Organic Cleansing Lotion gently removes makeup and impurities. It contains refreshing Witch Hazel floral water which tightens the pores for an even complexion. Weleda Natural Makeup Remover leaves your skin clean, fresh and soft ! 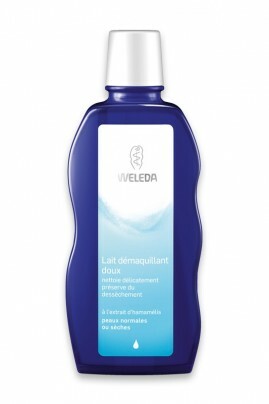 WELEDA Makeup Remover Lotion can be used day and night. Shake the flask and apply the lotion using a cotton pad or with your fingertips on the face, neck and decoletage, avoiding eye area. Proceed to small circular motions. Take off the product using a wet cotton pad or rinse with tepid water. Apply then WELEDA Refreshing Toner.